Have you heard the news? Three Super Beavers are taking the world by storm! Howdy Farmer! Pack your package, we are flyin’ to the west coast of Canada together! The Three Super Beavers can’t be missed! 2. I just checked our ticket and the in-flight meal is turkey sandwiches... Let’s make some nice Cranberry Sauce in advance to go with it. We all know what airline food can be like! 3. What a nice flight that was, but good thing we prepared the Cranberry sauce! Let’s head to our relative’s farm, Grandma says it has a nice seaside view. 4. Darryl and a couple of his cousins have all decided to go swimming! But wait, Darryl forgot to take his wetsuit, and the water is quite cold! Can you see Darryl here? 5. Wait here comes Darryl swimming to shore, but how can he swim so fast! Is that a turtle he’s riding on? It can’t be, Turtles are too slow... Wait he’s on a beaver, it’s Chomper the Super Beaver!!! 1. I still can’t believe my eyes! Beavers with super powers?! This is craziness! I need something to drink, I think I might be dreaming! 2. Poor Granny! She’s so amazed by this, I think she is in a little bit of shock. Let’s help her relax with some water and homemade cookies! 3. We’ve tried giving some of the cookies to Chomper, but it looks like he would like something else. He keeps looking at the Water Lilies we harvested earlier, let’s see if he likes that! 4. Every superhero has a mask, but only Chomper has a hat! Let’s go visit the neighbors to introduce our new super friend. Let’s bring some milk as a peace offering. 5. One of our neighbors needs some help, it looks like her kitty got stuck in a tree. Chomper is beating his tail on the ground to call for some back up. But I still can’t see the kitty, how can we take a closer look? 1. Help has arrived! 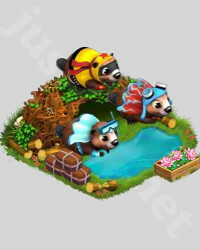 It’s another super beaver, Scooter! Let’s welcome Scooter to the farm and thank him with a gift for saving our neighbor’s kitty cat! 2. Bummer! It’s time to fly home and we haven’t found the third Super Beaver! Bye, bye Canada! See you next time! Let’s grab some water from the fountain real quick for the onward journey. 3. Home sweet home! Nothing like being back on the farm. Let’s make some items to freshen up the house and get back into the swing of things! 4. Oh no, after baking all those custards, smoke has started coming from the dessert shop! It’s on fire! But wait, there is the Beaver signal! Another super beaver is on his way!!! 5. Luckily, the super beavers saved the day. This beaver is named Nibbles! Let’s give him some thank you cards and some Water Lilies to express our gratitude. who tells about the story? Yuala, hi, a have added you, please confirm. I am very active in this game and so is my family. If anyone interested, you can add us: atteya mamiPetra LiamFa LiamFabiani I need active neighbours with a lot of different trees and crops.We are now in level 47, 61, 36 and 32. You can find there guarana, tea acai berry tree and much more. We return gifts daily! They unlocked the Guarana tree. I am so happy. @chansmast - Harvest Guarana from your neighbours! conclui a missão do castor e não recebi o terceiro castor. recebi um materials hide1 e diz que devo construir um habitat do supercastor...não entendi nada. Part 2 says to feed chopper some lillies. Where does cbopper come from? Does Part 1 have to be finished first? thank you very much AGB for your help. we need tea tree(12rc) to make essential oil in first step of this mission but there is no tea tree in our tree list even in new or special item .it will cost 6rc to skip the step . if we can spend 6rc + 6rc = 12rc we will have a tea tree for ever.so please tell me from where we can get the tea tree or add this tree in the special item list so that we can buy it direct from there .i am playing in myplayyard.com and in face book version . I found my Darryl on the first row, the one from the middle. first I clicked on the one with the starfish on the shoulder but wasn`t :)). I know is randomly but...who knows? Good luck peeps! We got missions, happy now. Is waterlily an RC needing crop? Does anyone know if this is ever coming to games games? Does anyone know if we are getting this on gamesgames.com ? You get an unfinished beaver habitat when you accept this mission. There are 3 parts to this mission you get a beaver as a reward for each of the 3 parts. 3 parts, 3 beavers. Hope this helps! Page generation time 0.0273 sek.